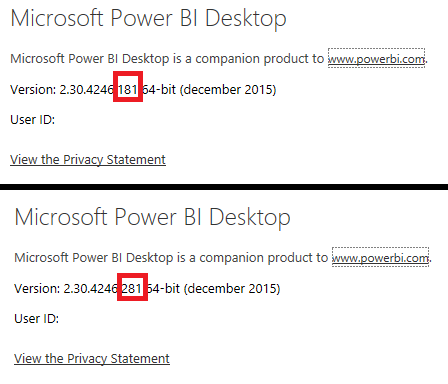 First off, let’s talk versions of Power BI Desktop. I ran into quite a big problem for part 3 of my blog and while trying to figure out the reason with Dustin Ryan (blog | twitter) we found out that I was running a different december 2015 version than him. I downloaded my version right after the update was available. 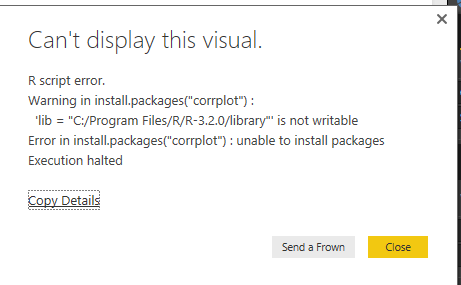 I’m guessing that the PowerBI team silently released a newer version afterwards with a minor update. Can’t really blame them, but from an enterprise standpoint, we need a notification and changelog to avoid version differences. 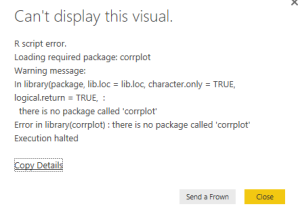 So to use non-standard packages (like corrplot or ggplot2 for example), you need to have these packages installed in your R library. If given write-rights to the library directory, Power BI Desktop can install these packages as well. 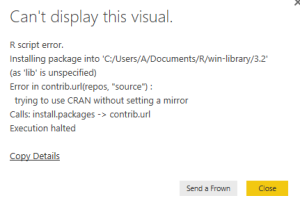 This is huge as it means that you don’t have to exit Power BI and go to R Studio. The user of your .pbix possibly wouldn’t even have to manually install the required package. From the previous point, it seems that R is just running in the background and that most of the functionality can be used. Testing some basic functionality like importing and transforming data in the R visual worked fine. I haven’t tried any predictive modelling yet but I assume that will just work as well. This brings me to an error that I’m currently receiving on both my desktop and my laptop. 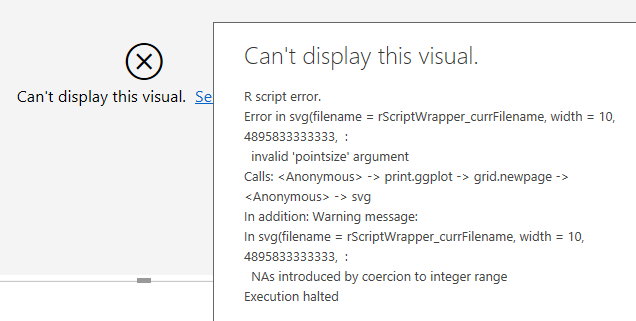 Do you know the solution for this error? 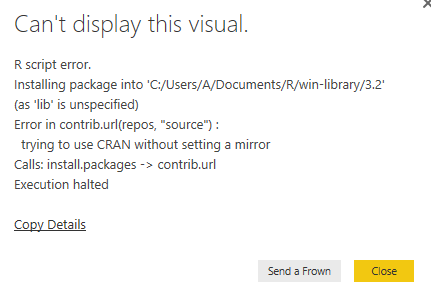 The awesome Tom Martens (blog | twitter) politely pointed out that I should RTFM a bit better as this error is caused by comma’s representing decimals. This explains why Dustin Ryan (US-based) was able to run my creation while I wasn’t. Instead of changing my entire region which has a larger effect aside from the decimal delimiter, I opened my control panel and just changed the Decimal symbol to a period. Doing this has the least impact on your system. Have you tried anything cool that should be mentioned or linked here? Leave a comment or get in touch via twitter or LinkedIn! Great blog – keep it coming! Modify your region settings format to English (World). This can be done via the control panel –> Region –> Formats. Again – we are actively working on fixing this. Thanks for the comment Avi, really appreciate it! I was already referred to that workaround this morning and the post was updated to reflect the solution, including a link to the official blog.